As malls get bigger and more cluttered, it's getting harder to find the Hot Dog on a Stick or the shoe section at Macy's. 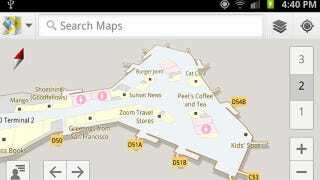 Well, mall rats rejoice; Google's My Location feature just got an indoor upgrade to help navigate your way through malls, airports, and department stores. Google Maps 6.0 for Android is available now in the US and Japan, and pinpoints your location in participating malls, airports, Macy's, Home Depots, and other retail outlets. It's like a directory in your pocket. Available for Android 2.1 and later, the latest feature uses floor plans from retailers to help you find the bathrooms and other points of indoor interest. Google has fine-tuned its My Location feature to locate which floor you're wandering around on looking for socks.